Both features are designed to give their customers more option and better control over analytics data. On this page, users can choose whether to opt in or opt out of sharing their Analytics data. When you will sign in for the first time in google analytics after March, 05, analytics system will ask to accept to data sharing. You need not to worry about your data, because this is not sharing individual data with competitors. These data will bucket into industry vertical and then anonymize and aggregate the data. Once you opt in, you will see its effect and use of features after few of weeks to get compared data and reports. Google is also launching an integration with Audio Ads on March, 05, which discussed in more detail here. All of these features will begin appearing in customer accounts today, though benchmarking reports may take up to a couple weeks to show data. For a long time, I was trying to share a tip with my seo friends and readers to increase and generating a huge traffic through SERPs of Google, Yahoo, MSN etc and referral sources. We do many hard work to get top rankings and good traffic without analyzing our traffic sources. Do you know what is best traffic sources of your website? What the huge traffic comes from to your site? Don't Know but I know about my site. I am getting best traffic from Google by searching a particular phrase and clicking on my website in SERPs by a general user. 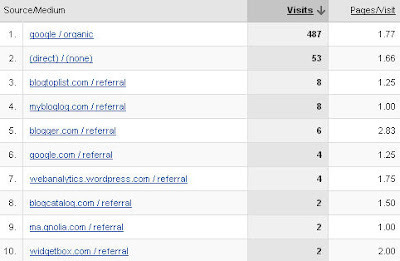 Another best traffic driven for my site by blogtoplist.com a Blog business directory. But, MSN is not driving traffic from my site for a long time. Third one good traffic I am getting by direct sources. Infact, direct traffic is appreciable in my opinion. Click on Traffic Sources to drop down the menu. Now come to the point, if you are getting organic traffic from search engine, what is best driven keywords? For example if a keyword generating 100 click, and is position it 10th rank and another keyword is generating 50 click and is position is 1st rank then which is keyword is best? Obviously first keyword that is generating 100 click at 10th rank position. Try to improve its position, it may generate thousands of clicks for your site rather than targeting other keywords. Another source getting some referral traffic from best resources like I am getting from directory, you may also get good traffic from web directories, blog directories, best sites etc. There are many directories online created by free directory software, but careful to submit your site in directories. First you should check its traffic value then submit to it. Yes if your website have good reputation and know by general users, obviously you might getting good direct traffic. After doing these little work, see the change after few days, you will get a much difference between the traffic reports compare than previous stats.